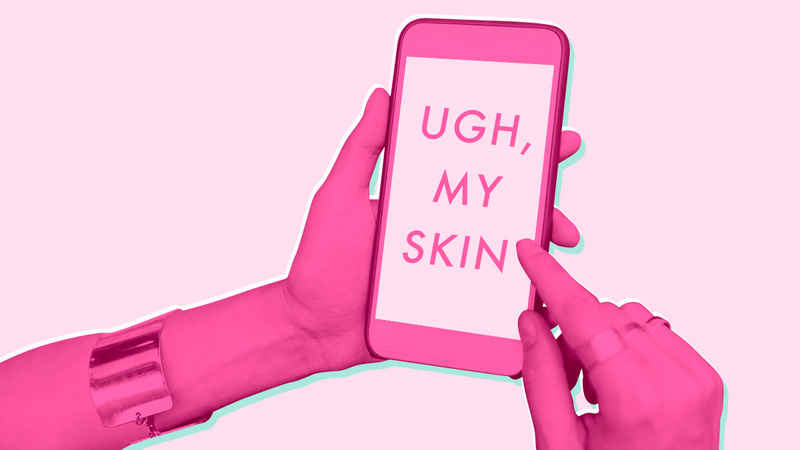 Dermatologists reveal how your phone may be affecting your complexion. Google "digital detox," and you'll get millions of hits of clickbait headlines and 12-step plans from various websites. But despite all that's been written about the digital-detox trend, the average adult still logs more than 10 hours of screen time every day, according to a 2016 Nielsen Total Audience Report—and the habit is dulling more than your brain cells. Allow me to explain: Basically, when you tap the home button on your phone, and the screen brightens, that glow is called visible light—aptly named, since unlike other light forms, like ultraviolet (UV) and infrared rays, you can actually see it. EV isn't another marketing ploy—there’s actually real science at play here. "We've always focused on the damage done by UV rays," says Steven Q. Wang, MD, the director of dermatologic surgery and dermatology at Memorial Sloan Kettering Cancer Center in New Jersey, and co-founder of Dr. Wang Herbal Skincare. "And, on a photon-by-photon basis, UV light is still more powerful in inducing overall skin damage than visible light, but as it turns out, there's just a lot more visible light to contend with,” he adds. But how does it mess with your face? Research on visible light and skin health is still in its infancy and studies are ongoing, but here's what experts do know right now: There is no proven link between visible light and skin cancer, says Wang, but, much like UV rays, HEV light is strong and can penetrate deep into the skin, sparking inflammation and unleashing free radicals—those wild molecules that attack our cells, contributing to premature aging and a host of degenerative diseases. "The inflammatory response that blue light incites can exacerbate redness and set off enzymes in the skin that break down collagen and elastin proteins," explains Loretta Ciraldo, MD, a dermatologist in Florida. That structural degradation is what contributes to fine lines, wrinkles, and sagging, she adds. Regardless of the instigator, "inflammation can disrupt the skin's moisture barrier, leading to dryness and irritation, and interfere with normal cell turnover, collagen production, and wound healing," says Joshua Zeichner, MD, the director of cosmetic and clinical research in dermatology at Mount Sinai Hospital in New York City. All this sets the stage for flaking, dullness, skin disease, and early signs of aging, he notes. The most well-studied skin risk posed by HEV light is hyperpigmentation, which results in stubborn brown splotches and spots. "More and more studies are demonstrating that intense blue light can cause a darkening of pigmentation, especially in those with deeper skin tones, like Asians, Hispanics, and African Americans," says Wang. By increasing the activity of tyrosinase, an enzyme in the skin that kickstarts melanin synthesis, "blue light can cause our pigment-producing cells to go into overdrive, promoting dark spots and worsening melasma," Zeichner explains. Ok, but don't freak out! Before you cancel on FaceTiming with your mom, it's important to acknowledge that much of the evidence pertaining to HEV light and skin "has been gathered by doing rodent studies at dosages considered unrealistic," says Ellen Marmur, MD, an associate clinical professor in both the department of dermatology and the department of genetics and genomic research at the Icahn School of Medicine at Mount Sinai in New York City. Plus, blue light isn’t entirely evil—in fact, it can be therapeutic: Dermatologists often use it, in measured doses and at prescribed frequencies, to eradicate the bacteria behind acne and to kill precancerous skin cells. So, when is blue light not skin-friendly? According to Marmur, "it's more likely that behaviors directly related to staring at a screen for prolonged stretches impact the skin more than the blue wavelength of light radiating from our devices. Fatigue, irritability, boredom, overeating, stagnation, lack of fresh air, monotony—these are not good for wellness overall and can breed odd habits, like scratching, picking, and eye-rubbing." Constantly peering down at your phone can strain your neck too, by the way (but we’re guessing you’ve already read a post or 10 about #techneck). Putting aside any potential threat from blue light, here's a good example of how compulsive screen-centric behaviors—like updating your feeds well into the wee hours and, thus, sacrificing sleep—can wreck your skin. The chronic fatigue that inevitably results from those late-night scroll sessions "can disrupt your cortisol rhythms, heightening stress, which has been shown to increase water loss in the skin, promoting dehydration, wrinkles, and overall sluggish cell turnover processes," Marmur explains. There's no need to become paranoid about the silent dangers of blue light; however, incorporating these simple strategies into your routine on the regular can help keep your skin looking its best. No really, put it down. Feels gooood, doesn't it? You don't need anyone to tell you how many times a day "the average millennial" checks her phone (think: more than 150 times), but yeah, keep in mind that every time you mindlessly illuminate that screen, you are bathing your skin with blue light, which may cause some degree of long-term free-radical damage and persistent hyperpigmentation. Switch on your phone's night shift option or downlaod a red-light app. Alternatives, like the Twilight Filter app, cancel out the negative effects of blue light, reflecting warmer tones instead of the cool blue ones your screen typically gives off. Beyond defending against light damage, these blue-blocking apps may encourage more beauty sleep: According to the May 2012 issue of the Harvard Health Letter, exposure to blue light at night suppresses the secretion of melatonin, the body's so-called sleep hormone, and messes with our natural circadian rhythms, leading to sleep deprivation. Whereas red light is more calming and least likely to affect your circadian rhythms and melatonin. "Mineral-based formulas containing zinc oxide alone or in combination with titanium dioxide tend to give better coverage against all kinds of light, since they act as a physical barrier to the environment," according to Zeichner. Beyond these reflective filters, there are "only a few ingredients that effectively absorb light in the HEV region," says cosmetic chemist Kelly Dobos. They include melanin (a synthetic version of the pigments found in skin), iron oxides (mineral-derived pigments), and carotenoids, like xanthophyll and lutein, which are plant-based pigments. Whether applied to the skin or taken orally, antioxidants extinguish free radicals and quell inflammation to help control damage and slow skin aging. In serums and creams, "the classic players—vitamins C and E, ferulic acid, polyphenols—can all help here," says Wang. Other ingredients, like the licorice root-culled Licochalcone-A in Eucerin Sun Fluid SPF 50, and the dimethylmethoxy chromanol (aka Lipochroman) in Dr. Loretta Anti-Aging Repair Moisturizer, have been tested against blue light specifically and may offer added protection. In the pill realm, Heliocare supplements—powered by antioxidant-rich Polypodium leucotomos, a tropical fern extract—"have been shown in recent studies to help protect skin against the damaging effects of not just UV and infrared rays, but visible light, as well," says Whitney Bowe, MD, a clinical assistant professor of dermatology at the Icahn School of Medicine at Mount Sinai Medical Center in New York City. Topping off your nighttime routine with a layer of an omega-rich serum can also help quiet inflammation and replenish essential lipids that restore your moisture barrier, nudging your skin back to baseline for that healthy, hydrated, #nofilterneeded glow.